Home » Blog » Should I Speak to a Trucking Company’s Insurance Company After an Accident without a Lawyer? An Experienced Trucking Accident Attorney Explains. A fully loaded tractor-trailer is going to be about 70 feet long and weigh up to 80,000 pounds. With an impact at speeds between 30 and 55 mph, that gigantic piece of machinery is no match for a 3,500 passenger vehicle. That passenger vehicle is likely to be crushed, and it’s occupants will suffer severe injuries or even die as a result of an accident with a tractor-trailer. When the crash is the fault of the truck driver or trucking company, their insurer is in for considerable financial exposure. That’s why an insurance company will try to start damage control of a case before the victim of a truck crash can even speak with an attorney. Obtaining a recorded statement from an injured truck accident victim is one of the first steps that the opposing insurance company will take to attempt to devalue a victim’s claim or deny it in its entirety. This is why it is imperative that you contact a truck accident attorney immediately following an accident to protect yourself from these aggressive insurance claim adjusters. Insurance companies are huge businesses. Their fundamental objective is to deposit premium payments and invest those payments so they can make even more money. When claims arise, their next objective is to pay out as little as possible in order to protect the insurer’s bottom line along with its shareholders. If you’re the victim, you’ll want to protect your case. 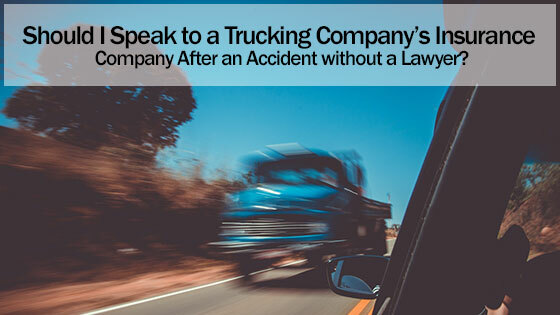 If you give a recorded statement to the opposing insurer after a truck accident without a truck accident attorney being present, it’s likely that you will unknowingly damage your case to the tune of tens of thousands of dollars. Here’s how they operate. You might give accidental inconsistent information. You don’t want the trucker’s insurance defense lawyers to call your credibility into question in court by saying you were trying to mislead the other insurer. The questions that the other insurer’s representative will ask you are designed to trick or trap you. Questions that they ask of you will be leading, and again, designed to trick or trap you. You’re being set up for cross examination in front of a judge and jury. When giving a statement, by answering the other insurer’s questions, your credibility can be attacked by using your own words against you in a courtroom the future. No law in Texas requires you to give the other insurance company a statement of any kind without an attorney being present on your behalf. Don’t allow that other insurer to try to wrestle control of your case from you. Contact us instead. We’ll be pleased to arrange for a free consultation with you. We promise to listen to you closely and answer your questions. After that, we’ll advise you of your full range of legal rights. Rather than giving up your rights, you can protect them by contacting our offices and speaking with a qualified and experienced truck accident attorney as soon as possible. Call our law offices today at any of our convenient locations to get a free consultation.